Every month there will be a new season, bringing new content and experiences to the bot! Type !season for rewards info for the current Season! Each new region will include 45+ locations, each location with 2 gyms, different Pokemon spawns, and more! Costs 10 redeems = $10. Get it by donating and typing `!redeem pass`. To donate for redeems, type !redeem and read it for instructions. Is there any disadvantage with purchasing the Season Pass late in the Season? Nope! Everyone gets the same challenges and rewards no matter when they bought their Season Pass. Which means, that even in the last few days of the Season, if you play enough, you will be able to get all of the 100 rewards. So to clarify again, you can indeed get all the 100 rewards from all the Season Pass tiers without paying for any extra tiers, even if you started late in the Season. There will be 100 rewards. 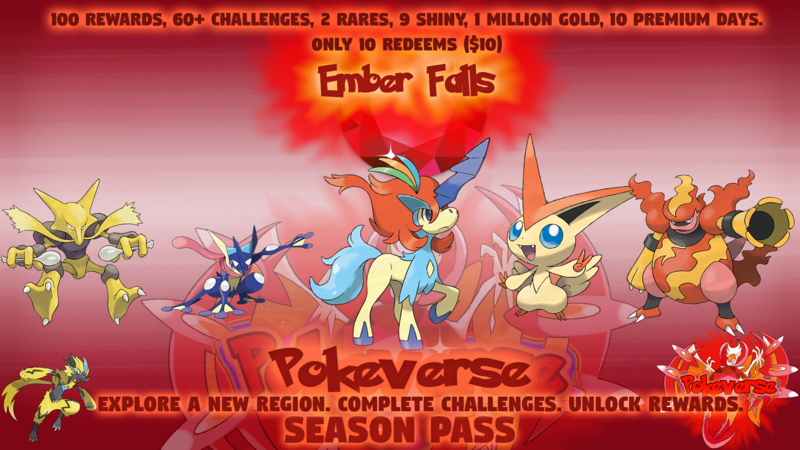 Each challenge (daily/weekly/season) will unlock a reward, or defeating a gym in the Season’s region. You can check the exact rewards of the current Season by typing !season [1-10]. Completing any challenge will give you your next Season Pass reward. Each day there will be a new daily challenge. You will have to complete all the previous daily challenges before you can complete the newest one. Each week (4 in total) 7 new weekly challenges will be released. You will have to complete all the previous weekly challenges before you can complete the newest one.